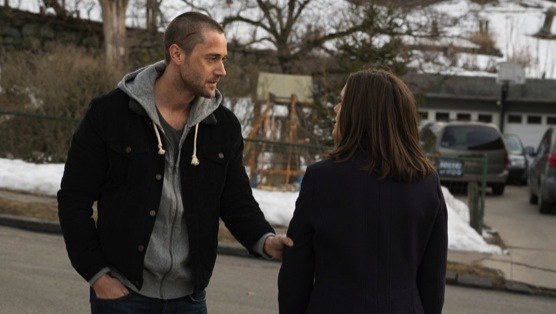 After a handful of episodes that focused on The Blacklist’s main cast, and after last week’s strange diversion into the seemingly impossible, “Vanessa Cruz” brings us back to The Blacklist as usual, but with the added benefit of some huge character moments. Our Blacklister for this week is Vanessa Cruz, a woman who has been framing businessmen who framed and killed her husband years ago. She has her own personal hit list of men upon whom she wants to get revenge, by framing them and ruining their lives. As with almost every Blacklister story, her convoluted backstory is much less important than the broad strokes of her character: she’s extremely skilled at deceiving and framing people. In the bigger picture story, The Blacklist is wise to try and speed up the whole Fulcrum plot, by giving Reddington only about a day to give the Fulcrum to The Director and his Board of Shadowy Figures before they will kill him. Reddington says he’ll help Liz catch Cruz if she gives him The Fulcrum, but instead she turns to get help from Tom, who will help her in exchange for his fake passports which he once hid in their house. Of all the lying men in Liz’s life, it seems like, at this point, she hates Red so much, she’d rather trust the ex-husband who tried to kill her. Maybe the most mysterious aspect of “Vanessa Cruz” is that whenever Reddington suggests someone for the list, he has an ulterior motive for wanting to focus on them, but that doesn’t show until the end of the episode. We see that Reddington wants to use Cruz—who gets away free by the end—and her set of skills for his own reasons. I believe that Reddington is (and I believe this would be a great idea for this show) trying to create his own Board of Shadowy Criminals that he can use to take down The Director. We see in “Vanessa Cruz” that The Director’s crew has unspeakable power, so Reddington needs his own gang to try to stop them. What better way to start such a crew than with a multi-billionaire from last week, and a master of framing people from this week? What this could do is not only make the minor weekly stories mean more in the larger context of things, but also, actually make them far more interesting than they ever have been before. I’m much more interested in Reddington using the Blacklist to create his own personal Justice League, than I am in him using it to just become wealthier. By the end of “Vanessa Cruz,” we end with our main characters at the most interesting points they’ve been at in a long time. Liz says goodbye to Tom, but not before the two share a goodbye kiss—a possible starting over for the two of them. Soon after, Liz agrees to give Reddington The Fulcrum, only to have Reddington get shot by a mysterious person moments after he admits to hiring Tom to infiltrate Liz’s life. Between The Fulcrum mystery looking like it potentially could come to an end soon, Reddington being more open to Liz at the advice of Dembe, and some actually intriguing things happening with our main and minor characters, it seems like maybe this time, The Blacklist is trying to move itself in a compelling direction that also makes sense. Of course The Blacklist had gone down this road before, only to disappoint, but maybe, just maybe, this will be the time it really does course-correct for the better.